Tom Sieber Wins Community Support! Brown County Tavern League, Green Bay Area Professional Fire Fighters, Professional Fire Fighters of Wisconsin and the National Association of Social Workers all endorse District 88 Assembly Democratic candidate. GREEN BAY, WI - This week we were proud to announce several more groups that have endorsed our campaign! These groups represent the hard working, dedicated men and women that make up our communities. I'm honored to earn their support and promise to work hard everyday in Madison to represent their interests! 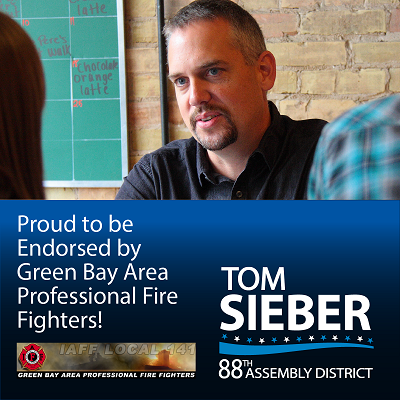 Join the Brown County Tavern League, The Green Bay Area Professional Fire Fighters, the Professional Fire Fighters of Wisconsin and the National Association of Social Workers in supporting Tom! When the working class does well, we all do well. We need more elected officials in Madison that stand with the working class and not with the special interest groups. I will stand with you when elected.